A bed bug is a small brown insect, around the size of an apple pip, that feeds exclusively from human blood. Bed bugs are hitch hikers. The females try to escape the male bed bugs and in doing so, crawl into out handbags, suitcases, rucksacks or adjoining rooms. If a female bug crawls into our belongings, she would then crawl back out when she feels it is safe to do so, this could be our homes, friends houses, airplanes, taxis, public transport or hotels. Female bed bugs lay 3-5 eggs a day, these eggs take 18 days to hatch. Once hatched, eggs take 6 weeks to become adults. During this time they go through 5 life stages, to grow from one life stage to the other bed bugs need a blood meal. Once these bugs become adults the females will be fertilised by the males and will begin to lay eggs. Bed bugs feed every 7-10 days, they can take 1-3 bites depending on how lightly we sleep. Bed bugs do not like movement and prefer to feed from us when we are most relaxed as this is the safest time for them. An adult bed bug can feed for up to 10 minutes to get a full meal. Bed bugs detect us through carbon dioxide and heat. They will detect when we are in a room and if hungry, will feed from us. If they cannot detect us, such us if we were on holiday (normally longer than a week) they will go into a state cause diapause. Diapause is like a form of hibernation. 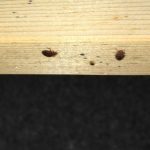 Bed bugs have the ability to shut down and reserve energy if the cannot detect us, they can go into this state for up to 18 months. Once carbon dioxide is reintroduced, the bugs will continue with their normal feeding cycle. When bed bugs cannot detect us they will either go into diapause or look for food elsewhere. This could be other rooms in our homes or neighbouring properties. Bed bugs can not fly or jump. They only crawl. Bed bugs are not nocturnal. If you sleep during the day, they will feed during the day. They do not exclusively live on the bed, They can infest, sofas, bed side tables, wardrobes, skirting boards or any where else convenient to hide between meals.